In an unprecedented move four Senior Judges of Supreme Court will address the media today. As per the reports Justices J. Chelameswar, Ranjan Gogoi, Madan Lokur and Kurian Joseph are expected to meet the press Today. There are allegations against Chief Justice of India against allotment of matters to benches and constituting Constitution Benches ignoring Senior Judges of the Court. There are confirmed reports that the allocation of a petition relating to Judge Loya's death to Justice Arun Mishra's bench was the immediate reason for the press conference. It is a matter of practice that Benches are constituted by the Chief Justice considering the previous orders and it is rare to exclude from reconstituted benches the Judges who had heard the matter earlier and are still available. 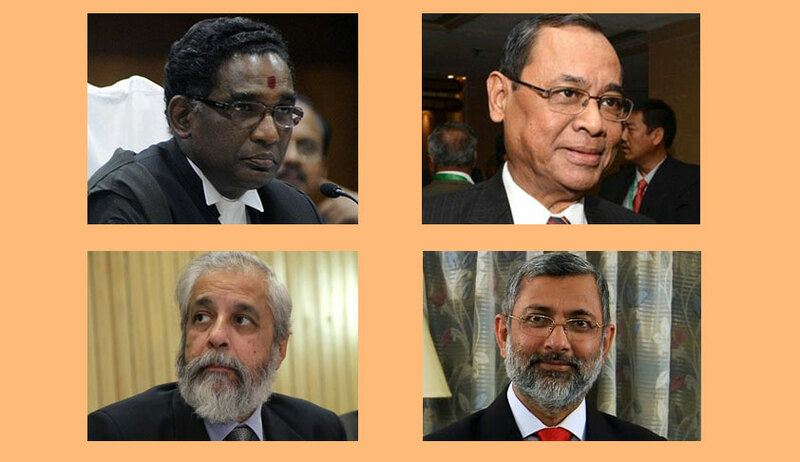 What led Chief Justice Misra to exclude those Judges can only be a matter of speculation. There has been a convention or a pattern which one has observed in the Supreme Court that major river water disputes are heard by Benches which do not comprise of Judges from the concerned States. Why should this convention not be extended to politically sensitive and serious matters coming from various States so as to exclude the Judges from those States from hearing such cases. After all justice must not only be done but must appear to be done. This principle has been reiterated by the Supreme Court itself. Also, judgments by the Supreme Court will have greater acceptability with the constitution of correct Benches. This does not end here. Recent trend shows that the Chief Justice who has powers to allocate cases appears to be doing so on selective basis. Again, it is not my endeavour to criticize the outcomes or judgments given in such cases. But the manner of allocation raises serious issues about the Independence of Judiciary. For example, recent matter challenging the appointment of Additional Director of CBI was placed before the Bench of Mr. Justice Ranjan Gogoi and Mr. Justice Navin Sinha, but the same was released by an order to the following effect, “List the matter on Friday i.e. 17th November, 2017 before a Bench without Hon'ble Mr. Justice Navin Sinha.” The matter was later listed on 17th November, 2017 before a bench presided by Mr. Justice R.K. Agrawal although on that very day Mr. Justice Ranjan Gogoi was sitting not with Mr. Justice Navin Sinha but with Mr. Justice R.F. Nariman and Mr. Justice Sanjay Kishan Kaul. The matter ought to have been placed before that Bench. The outcome could have been the same. But again this raises a very serious issue. There appears to be a pattern in distribution of such cases. There are many such examples which can be traced with careful examination. Matters involving Constitutional Authorities and certain issues relevant to political spectrum are being marked to certain Benches, the record shows. Unfortunately, this has been going on in the Supreme Court unchecked and uncommented for some time. Chief Justice Khehar allocated the Birla Sahara matter to a Bench presided by Justice Arun Mishra and Justice Amitava Roy overlooking 10 Senior Benches. Similarly Chief Justice Khehar, after converting an administrative letter by the widow of Kalikho Pul into a petition, allocated the same to the Bench of Justice Goel and Justice Lalit, who were sitting in Court No. 13, overlooking Court Numbers 2 to 12 for no reason. What then is the purpose of subject wise allocation of work to Benches and computerized allocation of matters? What can be, if at all, the justification for this? Does the Chief Justice not trust all his esteemed colleagues? Does he feel some are more competent than other? Or does he feel some are so independent that matters of political sensitivity should not be send to them? One is left only to guess.